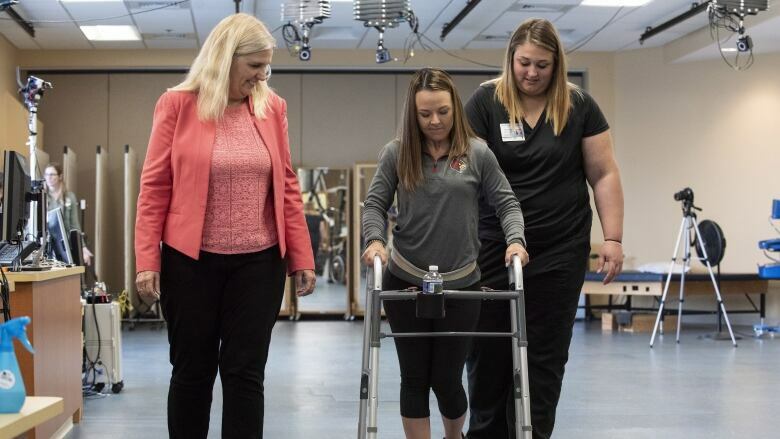 Three people whose legs were paralyzed for years can stand and take steps again thanks to an electrical implant that zaps the injured spinal cord — along with months of intense rehab, researchers reported Monday. "The walking side of it isn't something where I just leave my wheelchair behind and away I go," Chinnock, of Tomah, Wis., told The Associated Press. But "there is the hopeful side of, maybe I'll gain that — where I can leave the wheelchair behind, even if it is to walk to the refrigerator." It's not clear why the other two Louisville, Ky., participants weren't able to take independent steps. But that report illustrates an important caution about safety: One fractured a hip during a rehab treadmill exercise even while carefully supported and upright. The approach will need larger and longer studies not just to see if it can help other patients but to delineate risks. It's also not known how much such care would cost, as researchers work to improve the stimulators.